We took full advantage of another weekend at home by not staying home at all! We celebrated one of JD's friends' b-days Saturday morning, and then headed to another friends' house to watch some football in the afternoon. On Sunday we went to church as usual and then headed to Kemah for some outdoor fun. 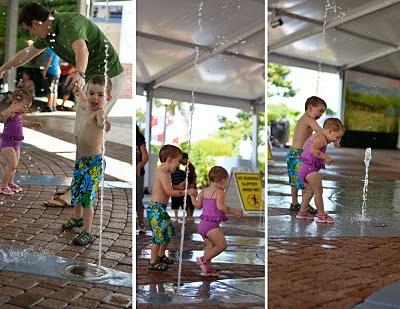 We spent the majority of our time at the fountain splashing around, but we also rode the train, which both kiddos loved. I got lots of pictures of the kiddos splashing around. I think I could tell a separate story for each one, but I'll limit myself to a few...for your sake! Both JD and Audrey were a little hesitant to get started playing. They watch from the sidelines for a while before Audrey got up the courage to try it out. She walked over to one of the holes, stood on it, and waited. I guess they're smart enough not to spray when you do that, so she waited for a while. Finally, she stepped off, and when it sprayed she stuck her head in! This was quickly followed by a shocked look and running back to Ross and JD. Then she just giggled and took off! Ross was able to persuade Jackson to move a little closer to check it out, and then Audrey took him by the hand and showed him what to do for a change! After that, both kiddos couldn't be stopped! They would run around, find a spray of water, stick their heads in, and squeal with delight as they ran back to us. I especially love the picture in the bottom right of this collage where it looks like the boys are all standing around watching the cute, brave girl! She's a Daddy's girl though! As I said, I took a lot of pictures. You can find the rest of them in the album.